All residential refuse from Roosevelt Island in New York City has been collected auto-pneumatically since 1975. Despite its 4000 meters of pneumatic tubes, all of the Island's recyclable material and almost half of its garbage--the non-hazardous trash from hospitals, businesses, parks, and sidewalk litter-bins--is still collected in trucks. Could the system be expanded to reduce truck traffic and position Roosevelt Island as a model for 21st century sustainable waste management? 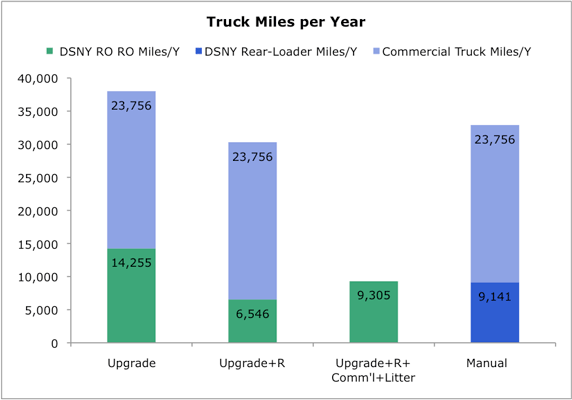 On behalf of CUNY's University Transportation Research Center, Region 2 (UTRC), we analyzed the costs and benefits of alternatives for upgrading and expanding the existing system and compared them to the conventional truck-based alternative. An upgraded pneumatic terminal would improve the energy efficiency of the existing pipe network by as much as 60% and save the City and State up to $1.7 million dollars per year. However, compared to the costs and impacts of conventional truck collection—the hypothetical situation in which Roosevelt Island’s pneumatic system is shut down and collection done by truck—the results were mixed. Significant reductions in truck miles—a critical factor for a planned community that was designed to limit vehicle use—and diesel-fuel are accompanied by increases in energy consumption and greenhouse gas emissions. One reason for these increases is the dense collection route and relatively small volume of waste, which make truck collection relatively efficient. Since diesel fuel is largely displaced by electricity in a pneumatic system, low-carbon electricity sources would produce fewer greenhouse-gas emissions than truck-based collection. The UTRC study was funded by the New York State Energy Research and Development Authority (NYSERDA) through a program that explores innovative techniques to reduce transportation-related fossil fuel use and greenhouse-gas emissions.